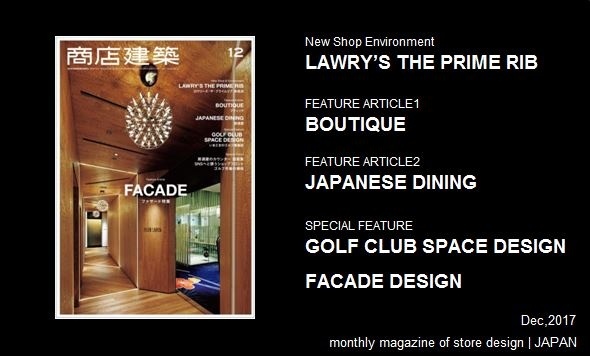 LAWRY’S THE PRIME RIB of Los Angels origin opened a Japanese branch in Akasaka, Tokyo. It is located in a commercial complex Akasaka Intercity Air. The ceiling is so high as five meter and the environmental design theme is “simple and stylish”. Based upon a chic and calm color scheme, the interior is gorgeous. David Singer, New York-based designer, created a lighting and art pieces for this establishment. A waiting lounge is in front of the facade where customers enjoy coffee and something. Two ISSEY MIYAKE stores opened, in succession, in Ginza, Tokyo. Both of “URA” and “OMOTE” exist in a short distance and they are functionally inseparable. The former, designed by Naoto Fukasawa, with a deep blue color scheme and the big sofa in the center is impressive. The latter, designed by Taku Satoh, is bright, open and white-themed. Shapes of the sofa there represent elegance of local color. Amsterdam denim brand DENHAM opened up a store in Ginza Six in Tokyo. A store concept is “mixed and much” echoing to the context of neighborhood of Ginza showing chaotic street scenes. There is, near the entrance, a so-called denim factory including areas for washing, drying, and repairing denims, which makes visitors experience some of manufacturing process of denim products. The interior materials are also mixed such as concrete, glass, mortar, recycled corrugated iron plates, wood and tiles. Tokyo style pop art pieces and American vintage toys are displayed and shoppers feel they are in a toy box. Konaka, known as a clothing store, started order-made suits store in 2016 and the design firm SAMURAI produced all aspects of the branding of the store from naming, logo, products, to the store design. You can make your order-made suits by visiting the store only once to be measured and after that you can make progress manipulati by smart phone. The store stockes more about 150 kinds of suiting materials and small boxes to present the clients sample materials of details of the suits. It surprises the customers who knows the store only on the web. Shoben-tango, the owner company of Tonchinkan restaurant was established in 1932 and they started to operate establishments thirtythree years ago. This project represents the ambition of the owner Yoshiko Hirakawa and the succeding brothers. There are layers of warm color clay walls which show a sense of time with warm upper bulb-lighting. Folk art dishes are framed and displayed on the wall like abstract paintings to show diversity. Visitors can enjoy seeing, through wood lattices, the works by BAKIBAKI, Osaka-based artist. Japanese restaurant WOKUNI opened near Grand Central Station in New York, it is located in the midst of competitive area for restaurants lunch users. Upon a design theme of “ocean & wave”, a designer, making the most of the high ceiling, elaborately used various materials with effective partitions and dramatic lighting to make a New York style Japanese interior. Near the entrance, there are art works to represent tuna which is one of the most attractive menus that people can take out. To emphasize the busy atmosphere in the interior for passers-by, sake bottle shelves reach the ceiling. A dining area in the back is very special with the use of custom-made seating of copper and brass repressing sunset of the sea. It also has a private room and always full of business people from Japanese-affiliated companies. Front facades must represent instantly business category and environmental design concept of what is behind the front door of the establishments. This featured article picked up thirteen examples of the facade design from a big commercial building to a small shop on a street. In a late part of the article, you see most talked-about facade on SNS for you to think about the essence of hot or photogenic styles on instagram. Since the collapse of bubble economy and Lehman shock, golfer population and market of golf business have been shrinking. Today, a number of golf club houses resort to make themselves renovated to unwind users. Some are like luxurious hotels and some villas surrounded by the nature. Here are three examples of the renovation with photos, drawings, and descriptions by the architects. Also here interviews with person interested about trend of the market and new business approaches.